Specifications Product NumberTN1735SGLUC Dimensions (English)5.2" x 8.7" x .67"Dimensions (Metric)132mm x 220mm x 17mmWeight (English)21.16ozWeight (Metric)600gBattery TypeLithium-ion rechargeableBattery Lifeup to 8 hrCameraYesSpeakerYesStereo Audio JackYesAvailable User StorageUp To 32GBExpandable MemoryMicro SD CardTemperature Range (F)14° to 140° FTemperature Range (C)-10° to 60°CInternal Memory16GBSD SlotYes Display Resolution, WxH1024 x 600 IPSScreen Size7"Display TypeColor LCD TransmissiveTouch ScreenYes GPS Accuracy3 - 5 metersHigh-Sensitivity GPSYes Type Ublox-7Barometric AltimeterYesAntenna TypeMultidirectional Patch3-Axis Electronic CompassYes Preloaded MapsUSA and Canada BasemapUploadable MapsYesPoints of InterestYesMap UpdatesYesPOIs Along RouteYesBreadcrumb NavigationYesBack to Start/LocationYesCustomizable ScreensYesBacktrack NavigationYesData & Route RecordingYes USER GENERATED CONTENT Accepts GPX FilesYesUser Data Online SharingYesLocations/WaypointsYesStores WaypointsYesStores TracksYesStores RoutesYes INTERFACE & COMMUNICATIONS USB PortYesPC CompatibleYesMAC CompatibleYesBluetoothYesWi-FiYes The TRX7 comes preloaded with over 115,000 designated OHV routes from forest and public lands and includes Magellan's award-winning street navigation to get you straight from your starting point to the trail. Search trails using your TRX7 or search for trails in a constantly growing crowdsourced track database on www.TRXTrailhead.com. Magellan's trail database contains over 115,000 preloaded OHV routes and user-generated tracks created by fellow off-roaders. The community database is accessible by desktop, tablet, or mobile device, and crowd-sourced tracks contain personal observations so that you can search for them by location, track difficulty, rankings, and more. You can also review trails and their attributes before you head out to the trail, then save to a list of favorites for future rides. Turn-by-Turn Trail and Street Navigation: Get visual and audible navigation guidance whether you're navigating off-road trails or streets on your way to your destination. Ruggedized IP67 Casing: Waterproof, dustproof, drop- and shock-resistant housing. 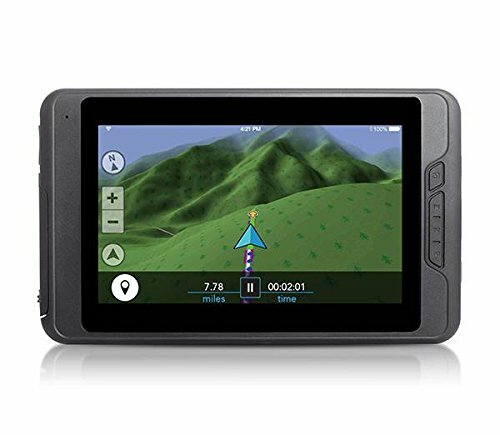 7" HD Touchscreen: Extra-large High definition color touchscreen to easily view while navigating trails or streets. Built-in 5-megapixel Trail Camera with Flash LED: No need to fumble around for your phone or camera. Quick Release Power Cradle: Keep your TRX7 charged on the trail and take it in and out of your vehicle with no hassle. Hi-res (10M) 2D Topo and 3D Basemap of the USA and Canada with Lifetime Free Updates: See high-resolution 2D or 3D map imagery and get free map updates with newly loaded trails several times each year. Satellite Map View Available with Subscription: Purchase an annual subscription to DigitalGlobe for viewing and saving satellite imagery. One-touch Social Sharing: Link a Twitter or Instagram account to send a Tweet showing your location and Dirt Miles on a trail or to share your photos on social media. Backtrack: Hit the Backtrack button anywhere along your track to route your vehicle back to your current track's starting point. Intuitive Interface: Ready to go right out-of-the-box. Within moments, you can record and save a track, save waypoints, search for trails, Backtrack, and more. Safe Waypoint Creation: For safety when moving, the TRX7 limits you to selecting only a waypoint type - keeping your attention on the trail. Off-track Notification: The TRX7 notifies you when you veer off a trail or track you're recording to get you quickly back on the trail. Custom Trail Details: Mark if a trail requires 4-Wheel-Drive, road conditions, terrain types, pitch, roll, and more to calculate the trails difficulty. Once ranked a trail can be published to the online trail database. Over 115,000 Preloaded Designated OHV Routes: Includes 4WD, ATV, Motorcycle, and Snowmobile trails. Companion App: Access your account, search, save, and see your position any time you're away from your TRX7 device. Online Community Trail Database: Go to TRX Trailhead, where you can discover new crowd-sourced trails, plan on- and off-road routes, and see satellite basemap layers. Searchable Trail & Off-Road Points of Interest (POIs): Advanced trail searching, plus millions of points of interest.